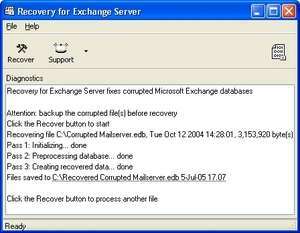 Recovery for Exchange Server is a data recovery program for Microsoft Exchange Server databases. Recovery for Exchange Server processes corrupted mail databases (.edb, .stm) and saves the recovered data to a common Personal Storage File (. Recovery for Exchange Server 5.5.16840.1 is a shareware program and can be used as a demo to try the software until the free trial period has ended. A full version of the program is available after the trial period ends. For security reasons, you should also check out the Recovery for Exchange Server download at LO4D.com which includes virus and malware tests. Additional screenshots of this application download may be available, too. Tools for maintaining your Windows server. Free downloads of software programs include networking applications, log addons and various other IP-related tools. Check out some of the freeware downloads available in the server tool category. They contain no strings and are available at zero cost. 4.5 out of 5 based on 25 ratings. Recovery for Exchange Server download been highly rated by our users. TrustRank Based on many factors, we give this program a Trust rating of 9 / 10.